Great Leadership: A Leadership Crisis or a Branding Issue? It sure has been a tough year to be a leader. In the summer of 2009, Development Dimensions International (DDI) surveyed 1000 US workers employed across industries and throughout the United States. Concentrating on specialists and professionals in non-leadership positions, they asked individual contributors how they feel about their jobs, their opportunities for growth, engagement levels, and skills they desired to develop. There were 6 key findings in their “Pulse of the Workforce” report. One of them was……. drum roll please…. Individual contributors are disappointed in their bosses and managers. Shocker. No surprise here. And dissatisfaction with leadership isn’t just a US issue. A survey of the UK workforce (3,000 adults surveyed by OnePoll), conducted on behalf of the Chartered Management Institute (CMI) revealed that 50% believe that they could do a better job than their current manager and a similar number (49%) said they would be prepared to take a pay cut, in order to work with a better manager. We’ve been hearing about the “leadership crisis” for years now. Just for fun, try searching “leadership crisis” and you’ll find thousands of headlines going back to 2001, from every industry, and from every part of the world. There is also no shortage of Monday morning quarterbacks, bemoaning the lack of leadership and telling leaders what they need to do to snap out of it. Lee Iacocca wrote a bestselling book a couple years ago, “Where Have All the Leaders Gone? ”, where he “sounds a howl of anger against the sad state of leadership in the U.S. today”. I hate to say it, but I’m almost getting numb to the whole “leadership crisis” thing. It’s getting tired. Sixty-two percent of the individual contributors surveyed have no aspiration to assume a management role. This anti-leadership sentiment showed up in several other areas of the research. Survey respondents were asked if they could leapfrog to any position in their organizations, what role would they take on. Very few, just 32%, find their boss’s job or even more senior positions appealing. It seems leadership has a serious branding issue. I wouldn't be suprised to see "leader" on next year's "Worst Jobs" list. If you think we’re in a leadership crisis now, we’re going to be in an even deeper crisis if we don’t do something to make the role of a leader more appealing to our best and brightest. So what can we do to address the real or perceived lack of leadership talent, as well as the branding issue? First of all, I really don't believe we have a leadership “crisis”. In any population, you’ll always have a bell curve of performers. So for leaders, 10% of them are bad, 10% are great, and the other 80% somewhere in the middle. See “Real Leaders Fire Underperformers”. Let’s start holding leaders in all sectors accountable. Its a few bad apples - the 10% - that are getting all the attention and causing all the problems. Throw the bums out. It’s true. It’s way to easy to point the finger at “leadership” when times are tough, and stand back smugly on the sidelines and complain. 3. Recognize and Celebrate the Great Leaders. To some extent we do this, but no where near as much as we should. Bad news never has sold as well as good news. Great leaders are all around us, and we need to expose people to them as role models and mentors. Here are some, and here’s some more, and some more. And how about this guy! These are the people we need to think of when we think “leader” – not the bums. 4. Improve the Selection Process. Help aspiring leaders make the right choice. Promote for leadership potential, not just high performance. For all those leaders in the 80% category – let’s help them become better leaders, through training, coaching, and development. The idea of a natural born leader is a myth, and we need to stop perpetuating it. Leadership is a skill that can be learned. The great ones are great because they’ve worked hard at it, harder than anyone else. What do you think? What else can we do to improve our worldwide leadership brand? Though likely a basis to their study, I think DDI's research should be taken with a grain of salt. Creating buzz around this so called "leadership crisis" may be just another way to entice people to use their products and services. Regardless of the "why" commit to leadership development, I agree that it is an imperative. Dan, this is a topic that has interested me for quite a while. How about joining Pam and me for an episode of the Weekly Leader podcast where we can roundtable it? Thanks for sharing all of the great stuff here. Thanks for this post. I appreciate you stating that leadership is something that can be learned and developed, I think that realization by more people is step 1. Instead of bemoaning the lack of leadership more people need to write about how the "great" leadership gap can be filled- instead of whining, more solutions need to be put out there so that more people will hopefully understand the impact that training and mentoring can truly make in developing not just okay leaders but great leaders- we need more than just the 10% good. Reward leaders. No, really. The super-CEO level may be way over-rewarded, but lower level leaders are given long hours, poor support, everyone's blame, awful flexibility for work-life balance, and pay that doesn't begin to compensate. A fancy title may have been a fair trade for all that in the 1950s but even we baby boomers have seen through that trick. Leaders jobs need to be humane and rewarding to attract modern workers. Dan, I am a big fan of yours, but I have to disagree with some of what you have written here. I happen to believe we do have a crisis in leadership, and its not an image problem, its a performance and values problem. Very true that performance will always follow a bell curve, and very true there will always be outliers on either end, but there can also be shifts in the mean performance for the 80% of normal performers. I think our standards for normal performance of a leader are too low. We need to be shifting the mean up, but that won't happen until you realize where the mean is and what the trends in the mean are. Love your point #1, but it does not mesh with point #2. The reason no one throws the bums out is because they can rightly say "well, no one is complaining." The reason no one complains is because it is not safe to complain. YOu get labeled a bum yourself, or toxic, or bad attitude - name your label of conformity - and then you get shown the door. The worst leaders know how to consolidate their power and eliminate those that would expose or challenge them, so they hang around to do great damage longer than they should. And those with the proximity and ability to actually do something about the bad leaders often have themselves a vested interest in keeping them in power. Sorry, but I for one won't collude in sweeping this one under the rug and putting on a happy face. To me it is the parable of the boiled frog. I agree, much of the headline leadership research I come across (like this one) comes from vendors that sell leadership development programs and products. The creation on a perceived “crisis” would indeed be self-serving. Thanks for the invitation, I really appreciate it. So far, I’ve been turning down invitations to participate in podcasts. Maybe some day though. And you are quite welcome! Thanks, I agree, we need more action and fewer surveys. Interesting point. I know a lot of individual contributors look at their boss’s job and say “no thanks, it’s not worth it”. To some extent, they are right – the expectations and demands are unrealistic. I’m just not if throwing more money at them is the answer. I have no problem with you disagreeing with me – that’s what forums like these are for. - I just don’t but into the notion that we have a leadership “crisis”. I think a lot of it is media manufactured (or as Sara pointed out, self-serving “research”). - I don’t think the standards for leadership have gotten too low – I think they’ve gotten almost impossible to live up to. - I certainly did not mean to imply that point #2 should be “sweeping the problem under the rug”. If you read the Goldsmith and Welch articles, I don’t think that’s what they meant either. In fact, Welch was notorious at GE for constantly churning out the bottom 10% of his managers. Their definition of a poor performer wasn’t just not hitting their numbers – it meant living up to GE’s standard’s of leadership as well. Thanks, as always, for your spirited comments! Your take on the leadership "crisis" reminds me of Matthew Stewart's take down of management gurus: the past was always great and the present is always crazy and scary (but if you pay the management guru, then he'll help you through). Thanks for being thoughtful and a little skeptical. Thanks. Stewart sure has an interesting take. Dan, I agree with your assessment. I see as the classic "blame game" individuals not assuming responsibility...blaming, complaining, the victim-game. Yes, (#3) celebrate the best. I remember observing several leaders (by rank) and thinking "I could never take on their position"; mostly based on their style and mostly their behavior. Then, it dawned on me one day: the value I bring to the table is that I would lead as me and that is a good thing. Thanks for your engaging blog! Dan, good point that throwing more money at managers isn't the right solution to making their jobs more attractive. Actually, when I suggested rewarding managers better, I wasn't thinking of money. I had better working conditions in mind. Dan, This may very well be an eventual branding issue, but first I think it is a definitional issue. What are we talking about when we say leader? Do we mean "manager"? I don't think that is the same thing. It seems that the DDI study talked about disappointment with bosses and managers. Yes leadership can be taught, but not to everyone. No matter how hard you try, I don't think that you will turn me into an opera singer (a good one). There are people that want to be leaders AND have some innate talent for the job. These people may be VERY different from the group that would be considered good managers. If you were going to choose someone on your staff to manage a project, odds are that person would be different than a person you might choose to lead a team. Organizations need both good managers and strong leaders, but they don't always exist in the same body. Maybe it is this expectation that is leading to this leadership crisis. Thanks for the clarification - makes sense to me. 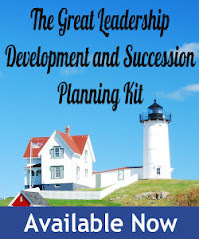 I get the distiction you are making between leadership and management, however, all of the hpye and studies regarding a "leadership crisis tends to refer to those in leadership positions, not the various competencies that make up both leadership and management. Regarding the "born vs. made" argument - take a look at the book "Talent is Overrated" - or any credible research on leadership development. The eveidence is clear - while there are some things that can't be taught, when it comes to leadership, most can be learned.